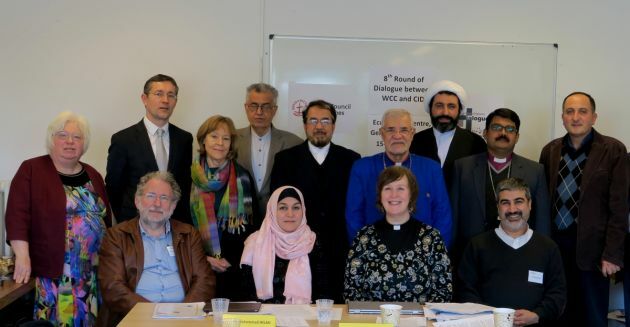 (Photo: © Peter Kenny / Ecumenical News)Participants of the Shia Muslim-Chstian dialogue meeting Nov. 16-17 involving the Centre for Interreligious Dialogue and Christians involved in the World Council of Churches at the Ecumenical Centre in Geneva. GENEVA - Mere days after terror attacks in Beirut and Paris, the theme of an interfaith meeting of Christians and Muslims at the Ecumenical Centre in Geneva, Switzerland on "Religion, Peace and Violence" was entirely appropriate, said participants. They spent two days candidly and honestly speaking about their faiths, in a dialogue between Shia Muslims from the Islamic Republic of Iran associated with the Centre for Interreligious Dialogue and Christians involved in the World Council of Churches. "There was a profound discussion about the fact that, though the means of violence and killing have become increasingly sophisticated in our world, the means for working for peace are still very simple and straightforward, namely the meeting with and openness towards those who are different to ourselves," said a participant. "It is important to speak with rather than about those who were seen as 'other'," reflected another after the meeting. "The particular difficulties that women experience in relation to religious violence were noted. Religiously motivated violence is often targeted directly or indirectly against women, and they are disproportionately victims." The WCC and the CID held their eighth meeting for dialogue in the Ecumenical Centre, Geneva, Switzerland, on Nov. 16 and 17, which corresponds to 25-26 Aban in the Persian calendar. The overall theme for this meeting was "Religion, Peace and Violence". "A sad reality that we witness today, and indeed has happened at many times, is the misuse of religion in order to justify violence and injustice and secure selfish interests," said Dr. Mohammad Ali Shomali, speaking at the meeting. Shomali is founding director of the International Institute for Islamic Studies in Qum, and the Director of the Islamic Centre of England. After the meeting he said in an interview, "Dialogue is the most natural thing we should do. This should enhance our love, friendship and unity. It is too little to think that we are here just to learn how to tolerate or respect each other. We are people who belong to the same family." "Then we share something that is great, the God of Abraham...Then we don't belong to different religions but different branches of the same religion. Although different prophets came in different times and places and spoke different languages, they are sent by the same God, and in the end of time there will be only one school and that is the School of God, in which different prophets or teachers may teach, but there would be only one authority and one syllabus. We should be united under God, but we may benefit from different teachers." Dr. Shomali had noted in a presentation, "Some terrible events have and may still happen in the name of religion." "Some of those who are against the whole concept of religion and 'sacredness' have taken advantage of these incidents and have argued that religion is the root cause of most injustices and atrocities, and in order to avoid conflict and troubles we need to get rid of all religions." "One of the fruits of a dialogue that has really been going on for 20 years, with some of the same and different partners, is that we can speak honestly with each and trust each other," said Dr Heidi Hadsell, president and professor of social ethics at Hartford Seminary in Hartford, Connecticut, in the United States. "Then we can begin to think about ways where we can hold each other responsible for working together and also working separately in our own communions," she continued. "Every dialogue has a different theme," she said. "In a way, these dialogues are cumulative in that we learn to trust each other and to speak more candidly. I think this dialogue reflects that. Another thing that is different is the urgency of the questions before us in the light of recent but also ongoing violence." Participants representing the WCC came from Germany, Iran, Lebanon, Pakistan, Switzerland, the United Kingdom and the United States of America. They met with four Islamic scholars and religious leaders who came from Iran and the United Kingdom.Mr Jahandar Mahdi, who is an imam of the Shia community in Geneva, was a guest at the meeting. "I have been involved in Abrahamic religions' dialogue for many years. I have also been involved in groups with discussion with Jewish organizations," he explained. Gavahi said, "I liked attending this dialogue. What we saw will have widespread reflections. It would be good to make a book of this meeting, and it would be widely read in Iran." Rev. Bonnie Evans-Hills who is interfaith adviser in the diocese of St Albans, England and a parish priest, serves on the Churches Together in Britain and Ireland's Interfaith Theological Advisory Group. "Faith communities have to come together. Differences between faith communities have largely disappeared," she said. Evans-Hills said she would probably disagree with a notion discussed that young people are fleeing from religion because they are bombarded with a secular, materialistic world. "I would say young people tend to leave organized religions because they are fleeing from the exclusivist positions some of our leaders take. We need to work with all faiths," she said. She saw in the Geneva gathering offering an "incredible amount of hope. It is almost as if we have a shared martyrdom and a shared innocence. Those who want to kill don't care whether they are killing Christians, Muslims or Jews. We are all in this together, and we need to pull together and love one another."